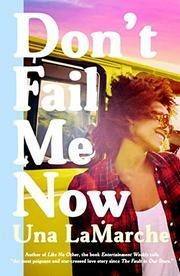 Like Kissing in America, Don't Fail Me Now is a road trip book, though much less successful. Because of Una LaMarche's Like No Other a standout from 2014, I was hopeful that Don't Fail me Now would be just as revelatory and engrossing, with a strong and ambivalent main character anchoring the story. Like No Other is a brilliant romance between teenagers Devorah, a Hasidic Jew and Jaxon, a Caribbean-American, both living in Brooklyn, close together and worlds apart. Don't Fail Me Now is about three African-American siblings with nothing to lose, crossing the country to find their ailing father in hopes that he might have an inheritance or heirloom for them. They are joined by their white half-sister Leah and her brother Tim, who they've only just met in the parking lot of the Taco Bell where 17-year old Michelle works. This chance meeting and the Deveraux's desperation and near-homelessness motivates their desire to track down their dad. LaMarche addreses the class and race privilege of Leah and Tim and the struggles of Michelle, Cass, and Denny, but in a rather rote way. I was excited for this book and hopeful for LaMarche to write another culture clash story but this time the characters weren't as well written and the story was too melodramatic. Margo Rabb is an accidental writer of YA fiction. Her book Cures for Heartbreak was intended for an adult audience but ended up being marketed to teen readers. Thank goodness for that. Would her new book Kissing in America exist otherwise? Kissing in America feels like a bespoke novel for me. The cover design makes me happy. A road trip with love and friendship, at 400 pages, it is long enough for the reader to become fully immersed in the characters' lives and is packed with heartbreak and hope. I don't know if I can put it any better than the writer E. Lockhart, "Margo Rabb has created nothing less than a women’s map of American mythologies, navigating from Emily Dickinson to Barbara Cartland, from the cowboys of the rodeos to the makeup studios of Hollywood, and from the bottom of the Atlantic to the spacious skies of the USA". As in a lot of YA realistic fiction, our main character, Eva is dealing with the death of a parent. The tragedy marks her relationship with her mother and the adventure she takes with her friend, Annie and her Aunt Janet. Eva is a smart, but reluctant girl, a character in the mode of an A.S. King or E. Lockhart feminist teen, figuring it all out. Without being too spoily, my only quibble is that it makes me crazy when things don't work out for characters I love. Even when it makes sense on a story level. I just want everyone to be happy! Rabb creates smart and real characters, while also avoiding sentimentality. A rare delight, both funny and sad.